How would you feel if your equity portfolio declined in value by a third over the next 16 months? Why do I ask? That’s what an average stock bear market looks like from peak to trough. Since the end of World War II, there have been 11 bear markets, where the stock market declines by 20% from its peak value. They occur about once every five years, and then, on average, it takes another two years for the market to regain its previous high and begin moving upward again. Over the course of an average 40-year working career, a person can expect to experience about eight bear markets. Over the course of an average 30-year retirement, a person can expect to experience another six. My Wall Street career began on Monday, July 8, 1985 at Kidder, Peabody & Co., Inc. on the 9th floor of 20 Exchange Place in New York. Ronald Reagan was President, and the S&P 500 closed at 191.93 on that day. At the end of 1985, the S&P closed at about 211. So far, I have only experienced four bear markets in my career, but the last two also happened to be the two most severe since the end of WWII. From March 24, 2000 to October 9, 2002, the S&P 500 declined by 49%. And then from October 9, 2007 to March 9, 2009, the S&P 500 declined by 57%—the largest drop since the Great Depression. I also had a front row seat for Black Monday on October 19, 1987, when the stock market dropped 22% in one day—the largest single price decline in U.S. history. So three out of my four bear markets have been doozies. But while stocks appeared to be going to zero from time to time, a funny thing happened along the way. They actually recovered and reached new highs. From the closing level of about 211 on the last day of 1985, the S&P 500 closed at about 2,044 on the last day of 2015—almost a 10x increase in price, or an 869% gain, which is equivalent to a compounded growth rate of just under 8% (excluding dividends). But now, let’s turn the tables a bit. How would you feel if your bond portfolio declined in value by a third over the next 16 months? And just to be sporting, we’ll completely ignore the credit, or spread, risk associated with corporate bonds—either of the investment grade or junk variety. Instead, we’ll limit our discussion to Treasury bonds—backed by the full faith and credit of the United States government. A decline of one-third in the value of Treasury bonds? Can’t happen, you might think. Think again. The duration of a bond is a measure of when an investor gets his money back. Longer-term bonds have higher duration—as do bonds with lower coupon payments, because low coupons means more waiting. 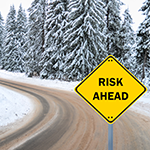 And duration implies risk: A rule of thumb is that a one percentage-point change in interest rates implies a change in the bond’s price equal to the duration. Modified duration is a measure of interest rate sensitivity. It measures the approximate price return given any yield move (yield move x modified duration as a negative number = price return). The most recently auctioned 10-year Treasury due May 15, 2026 has a coupon of 1.625%. As of the May 20, 2016 closing price of 98.023 (relative to par of 100), it had a yield to maturity of 1.843%. And the modified duration was about 9.2. If rates were to increase by 1%, the new yield would be 2.843%, and the new price would be 89.479. If rates increase by 2%, the yield rises to 3.843%, and the price declines to 81.754—or a drop in price of about 17% from today’s level. 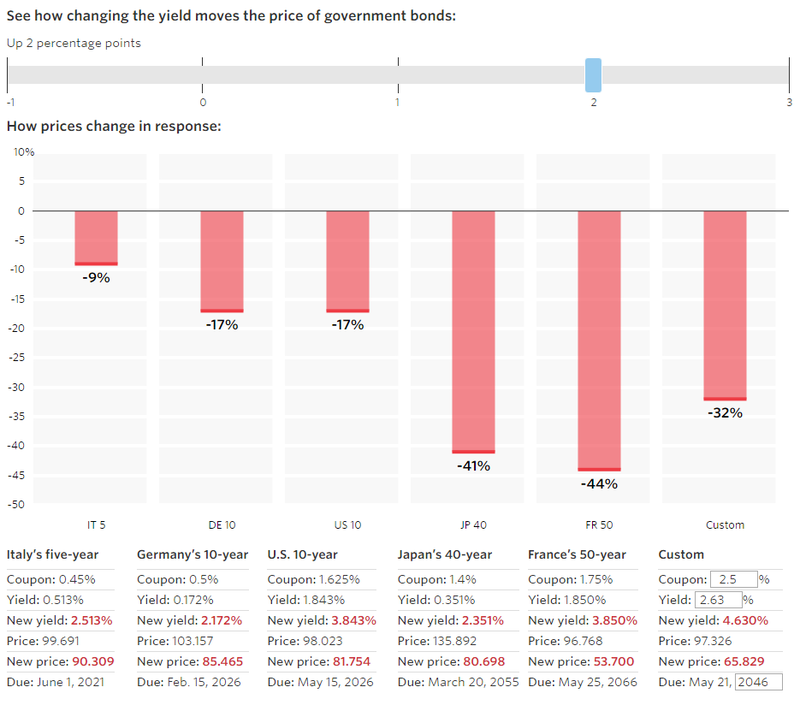 There is an excellent government bond duration calculator available on The Wall Street Journal website that allows a user to interactively change interest rates to calculate the change in price of various government bonds from different countries: http://graphics.wsj.com/government-bond-duration-calculator/. Using this calculator, we entered the characteristics of the current 30-year Treasury into the Custom field in the last column. With a coupon of 2.5% and a yield to maturity of 2.63%, the 30-year had a modified duration of 20.8 as of May 20. So a two percentage-point increase in interest rates would cause the price of the 30-year U.S. Treasury bond to decline by a third. It’s also interesting to see what would happen to holders of Japan’s 40-year bonds (current yield of 0.35%) or France’s 50-year bonds (current yield of 1.85%) with a two percentage-point increase in rates. In such a scenario, those bonds will lose 40% of their value. Of course, these bondholders always have the alternative of waiting 40 or 50 years to get a return of their original investment. Over time, equities—not bonds—have been the best way to preserve and grow purchasing power. Since 1926, equities have delivered a 7% real return for large-company stocks and a 9% real return for small-company stocks, double and triple the 3% real return for bonds. Equities are more volatile than bonds, which explains their higher returns. But we don’t equate equity volatility with risk. Volatility is just a short-term disturbance, but the long-term returns from equities are enduring. The bumpy ride is the reason for the return. You own equities because they go down temporarily and up permanently. Volatility is the norm in the equity market. Since the end of World War II, intra-year declines have averaged 14%, and temporary declines of 15% to 20% occur, on average, about one year in three. Roughly one year out of five has seen a bear market—a decline of 20% or more. 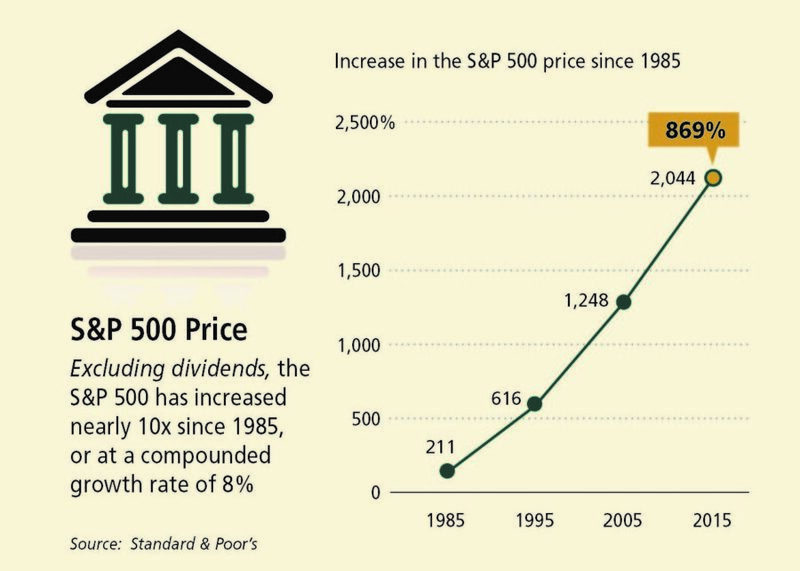 Nonetheless, the equity market is now more than 70 times higher than it was in 1946, and dividends have increased by a factor of 40.